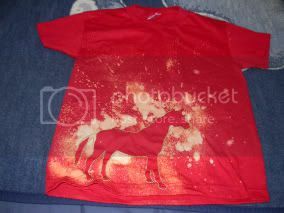 Craftster Community > CLOTHING > Clothing: Completed Projects: Reconstructed (Moderator: meleriffic) > hand bleached horsey shirt! i made this shirt a while ago. it reminds me of modest mouse. 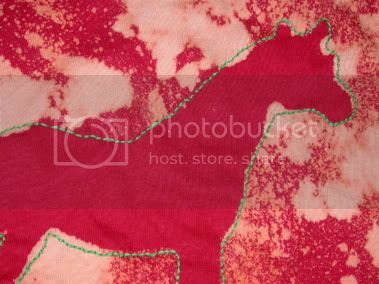 i just sprayed bleach over a stencil of ahorse and sewed the edges with green thread. Re: hand bleached horsey shirt! I love it! what size is it? I would trade you a lovely knitted item for such a shirt! unfortunaltly i sold alot of thse on ebay already but id be happy to make more! i cant wait to smelll the bleach! Ooh I love making shirts like that! I made a red one with dolphins, it reminds me of yours. Good job. How did you spray the bleach? WHERRRRRRRE would you find that? My bleached creations always come out weird, because the fabric eats the bleach. So pretty &perfect due to your steady hand. the fabric eats the bleach. Haha, I didn't really figure that out until I tried bleaching jeans, and ker-plush theres holes. Tiny, itty bitty holes that grew into large monster holes I DID NOT want. But, I'm guessing I didnt rinse it in cld water afterwards? I was only 12 when I did it. Two years ago, I haven't gained much expierience, but whatever.